A tisket-a-tasket come see what's in our basket! You can mostly make it ahead of time! 20,000 pounds of barbecue, a stump speaking tradition, and so much more. Say Gutentag to an outdoor dinner party worthy of the German countryside. No matter how small your house is, you always have room to throw a picnic. A new not sad desk lunch—and a more welcoming potluck and picnic salad than most. You'll want to buy a bigger basket. 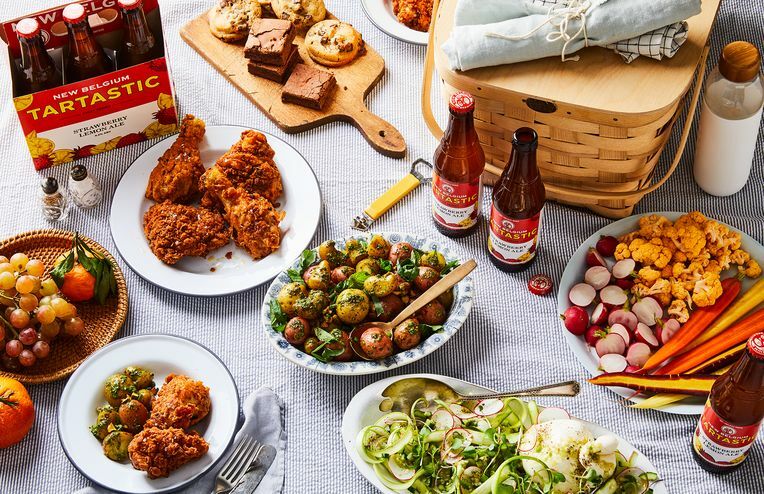 Make sure your snacking game is on point at any picnic with these 15 recipes. We tried out our exclusive denim sandwich wrappers, flatware set, and food covers on the sidewalk, a fire escape, and a square—because sometimes a hankering for a picnic can’t wait for the weekend (or sunshine). Throw something new on the barbie. A creamy coleslaw by which to judge all others -- and how to prevent it from getting watery. The best desserts to pack for a picture-perfect picnic. Make your day at the shore as easy-going as possible. A salad as relaxed as the perfect summer afternoon. Congratulations to Shannon, whose Roasted Potato Salad with Mustard-Walnut Vinaigrette won the contest for Your Best Picnic Recipe!